Whatever, just indulge us for a moment. 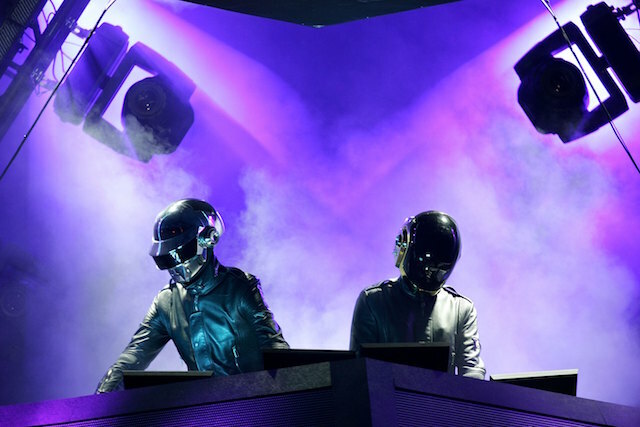 Daft Punk, that helmeted pair of French DJs/producers, has gone on only two full-scale tours. The first time they toured was in 1997, which resulted in the live album Alive 1997. After a long hiatus they went on the road again in 2007, calling their tour "Alive 2007." (Note: I went to one of these shows. It was at the former L.A. Sports Arena and the person in front of me threw out his back). Breaking out my calculator, it becomes evident that these tours were ten years apart, and that the number 7 may have some significance. Well, 2017 is fast approaching, and Daft Punk hasn&apos;t toured since Alive 2007. So...ah nevermind, just wishful thinking. A website—alive2017.com—has cropped up, and it&apos;s been at the center of a whirlpool of rumors. At first glance, the website is pretty sparse save for the text "ALIVE." However, as noted at Genius, you&apos;ll see a line of numbers hidden in the "I" if you zoom in. It&apos;s a countdown that ends on October 27, 2016. What is it counting down to? That&apos;s for you to guess. Where it gets really interesting is that, as discovered by users on Reddit and tumblr, the source code of the website includes (seemingly) random lines of number that are in fact coordinates for several major cities. The locations include Paris, Los Angeles, London, Tokyo, and New York. You know what other city is included? Indio. That&apos;s right, the site of Desert Trip Coachella. On Tumblr, "Irene" from Spain also figured out that one of the coordinates is for the Andromeda Galaxy. Also, the code includes the line "SHEP LOGGED OUT." Irene notes that Shep was the name of a character from Interstella 5555, an animated feature that&apos;s comprised of Daft Punk music videos. i&apos;ve been doing web hosting for around 20 years. based on 5 minutes of poking at their domain setup and IP space, this website has nothing to do with the infrastructure hosting daftpunk.com and looks very amateur, while daftpunk.com looks very professional. Our take? We&apos;re guessing it&apos;s a website promoting a reboot of 1993&apos;s Alive, which features one of cinema&apos;s more well-known moments of gastronomical gross-outs. Either way, we&apos;re scaling back our hopes, because we know what happens when you put too much stock in cryptic websites.